A reported 180,000 participants filled the closed-off streets on the 15 mile route, a new high water mark for attendance. The event garnered national attention (including one towering two-wheeler), though it did manage to piss off more than a few delayed motorists. True, a "bike traffic jam" did clog up the works on Venice Boulevard at Robertson. And, as LA Observed reflected, things "got a bit backed up" at several points along the route. Rosendahl has learned the event was such a hit that organizers are already in the very early stages of planning for the next CicLAvia to the Sea (April ’14). Organizers say they want to use the same route, and next time they want to close both sides of Venice Blvd. for bikes, as opposed to only one side (westbound) that Angelenos experienced this year. 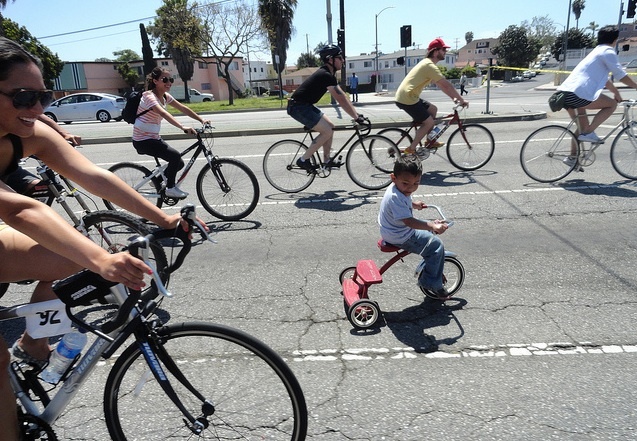 Bigger might be better for the participants next year, if CicLAvia continues to be progressively more well-attended. Of course, that means more chances for Angelenos opting to stay in their cars for the day to complain about the damn traffic.